Gjergj Sinistaj is playing on Day 3 of the Main Event and has pieces of action spread across the Amazon Room. If you look in the Brasilia Room at Joe McKeehen’s Main Event title banner, you see a man holding up the championship bracelet with a $7.6 million smile on his face. Behind the pile of money and glory are another man who helped to finance McKeehen’s buy in and the entry fee for at least a dozen more players that year. 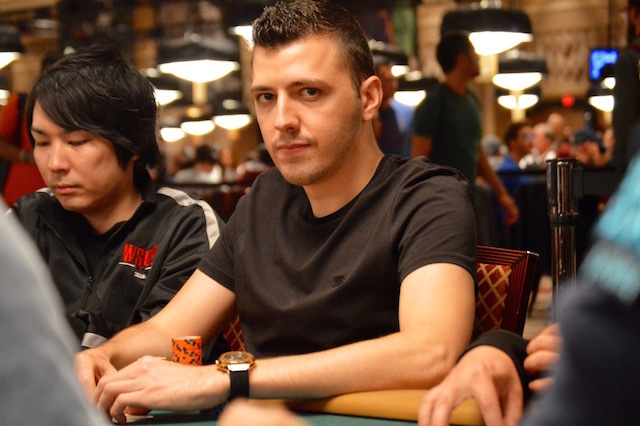 Gjergj Sinishtaj has grown from the preeminent online cash game prodigy of his generation to piece buyer extraordinaire. Sinishtaj played in some of the highest-stakes games as a teenager and was featured as an adversary against the “2 Months 2 Million” team under the screen name of “Blewjob.” Online poker is obviously not a prevalent option across the United States and as a result, Sinishtaj has turned his attention toward the occasional live game and piece buying with the Main Event serving as his personal trust fund. In 2015 and 2016, Sinishtaj says there were 15 players of whom he had a piece of. Not all of the buys panned out by the ones that did, earned Sinishtaj a fortune. Sinishtaj had 30 percent of McKeehen’s action when he won and then had approximately 65 percent of Gordon Vayo’s$4.6 million score for taking second place last year. There isn’t a specific method to Sinishtaj’s brilliance but he does his due diligence to make sure the pieces he’s buying are worth the full investment. In 2015, Sinishtaj cashed for the first time in the Main Event, bowing out at the end of Day 4. Sinishtaj was preoccupied with his own play as he is this year with 200,000 in his stack as of Level 13. There are 30 players, according to Sinishtaj, that he has action on this year but he doesn’t keep tabs on how they are doing until the end of the day while he is playing. It makes sense for Sinishtaj to have more players in this year’s field based on his previous success and after putting out a tweet along with some word of mouth, Sinishtaj had players reach out to him to have their action bought. Along with the $10,000 he spent on himself to enter the Main Event, Sinishtaj has $100,000 invested in the field within his pieces. Sinishtaj says that both last year and this year were a struggle in terms of ROI prior to the Main Event. Vayo was able to save Sinishtaj’s summer in 2016 and with about 1,800 players currently remaining, chances are that there are few horses still in who can carry Sinishtaj to the finish line for the third straight year.